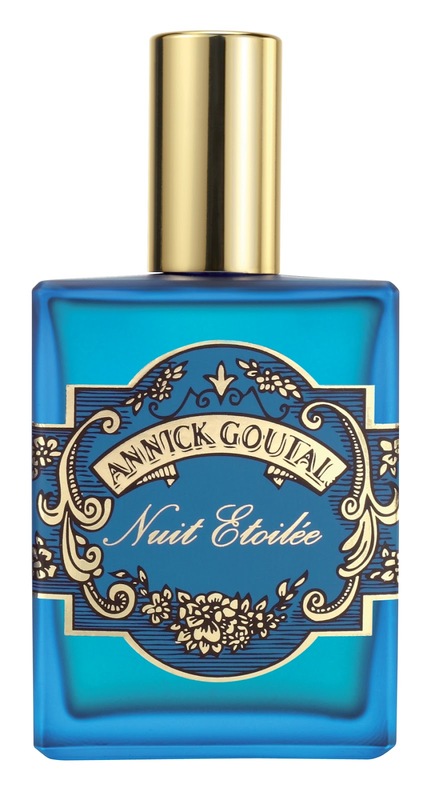 I present another beautifully constructed, aroma-therapeutic, always appropriate, refreshing, smart and sophisticated Annick Goutal creation: Nuit Etoilée, the newest fragrance from this stunning house. Simultaneously refreshing, cooling, comforting and eventually warming, the scent has consistently captured my intrigue over the course of the last week. I apply it generously, enjoying the initial blast of citrus which fades to reveal an exotic forest emanating the scent of pine needles and balsam fir. Just as I dream of resting on a bed of soft leaves, moist dirt and scented pine needles, the warm, musky angelica seeds gently arrive, lingering on my skin for hours and reminding me that all is well. <="" span="">To describe Nuit Etoilée as gorgeous would be an understatement. Exquisite suits it better but does not capture entirely its artistic beauty. 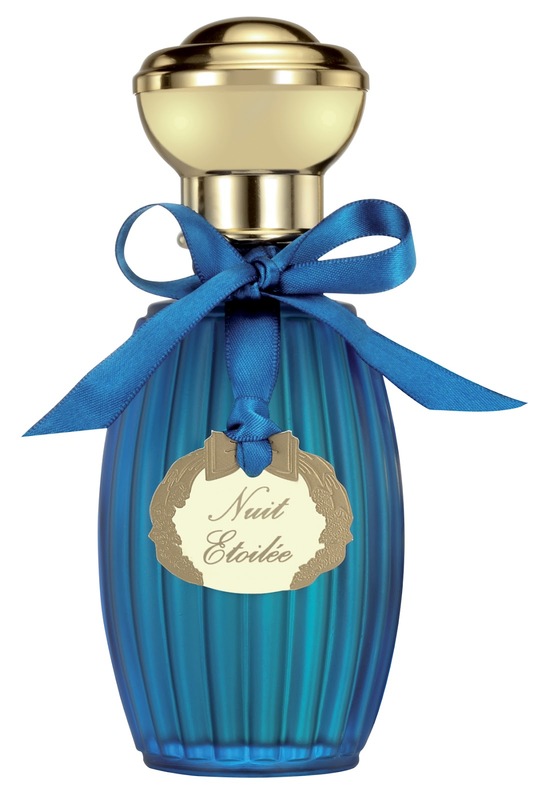 For demonstration's sake, if I scented all of my clothing, my hair, my skin, my home and even my car where I spend the bulk of my time with Nuit Etoilée, I still would not be overwhelmed by this fragrance. I would relish it as it calmed and soothed me in moments of elation or stress. (I have learned through life experience that even elation can be toned down, for what goes up must come down!) The citrus is the most smooth, lighthearted citrus I can imagine. If citrus can even be called mellow, it would apply here. The pine needles and balsam fir do not transport me to a Christmas Shoppe, but rather evoke the heart of the forest with a subtly suggestive nudge. Finally, the angelica surrounded by everlasting flowers!! I am speechless. Warm, glowing, and musky, it is the most grounding and soothing note I have ever experienced. Similar to my coveted Les Nuits d'Hadrien, Nuit Etoilée falls into the previously mentioned "always appropriate" category. Rather than making a fragrance announcement as the wearer enters a room, this scent is much more private and personal. I am not certain, in fact, if it provides any sillage. That fact does not much matter when the divine juice truly possesses aroma-therapeutic qualities. The only downfall to Nuit Etoilée, and I really hesitate to point this out since I so clearly adore this scent, is that on my skin longevity is not its strong suit. Perhaps if I slathered on unscented moisturizer first, it would linger a few more hours. Nonetheless, I am happy to bring with me a smaller, decanted atomizer and spritz myself repeatedly throughout the day. Well worth the extra effort? Emphatically, "Yes!" The packaging is equally stunning, produced in icy blue glass which changes color depending on lighting. Camille Goutal and Isabelle Doyen have really "hit it out of the park" with this creation and I strongly recommend it for day or night for anyone liking comforting woodsy, musky scents. 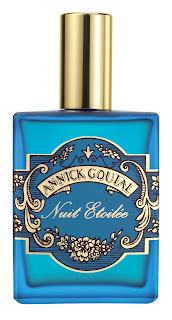 Annick Goutal Nuit Etoilée will be available mid-May in Eau de Toilette at Saks Fifth Avenue. A 3.4 oz. and 1.7 oz. traditional ribbed bottle will retail for $72 and $51 respectively. A 3.4 oz. will also be available in a masculine square bottle for $72. Hi Ankica! Oh, I am so glad it arrived in one piece. You are most welcome. You must let me know what your thoughts and impressions are of the fragrance. It's a unique one! I also liked Nuit Etoilee very much. So much that I bought my own 100ml bottle, in it's "male" square form. I love the blue bottle. I have not yet tried this AG, but I just love this line. It's hot here, and I am sporting Nuits d'Hadrien body cream. Have you ever tried Sharif? Not the Omar Sharif, but by profumo parfums? It's so beautiful-i think you would love it. A friend gave me a bottle last year. It's a bit hard to find-only 1 spot in us, and 1 in italy. This is a great post on one of my new favorite perfumes. Nuit Etoilee is one of my most exciting precious finds of the year. It's sumptuous and is gloriously evocative of a grove of conifers on a cool night. As you said, the citrus is the mildest and least shocking imaginable. This one is something like alchemy. Absolutely gorgeous! I have a small sample and didn't like it at first. The minty freshness grows on you, i reach for it on gloomy rainy days. Agree it is gorgeous! Count me in as i love this too! But not at first, but strangely after you first test it-it then calls to you, like a drug it tugs at you for more. So glad to hear you are enjoying this one. I apologize for my late comment here. I have not tried Sharif but I will with your suggestion. Thank you! You are spot on and yours is such a beautiful description. Thank you for reading!